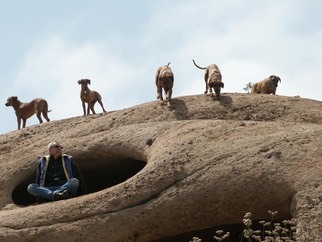 Ridgebacks are “people” dogs. Our current pack love to be where we are and be included in our activities. They are quite happy to laze around in the sun if there is nothing better to do. But they do enjoy, and thrive on, a daily exercise routine. We alternate between walks in the neighborhood, free runs in the local wilderness areas and bicycle workouts. In order to include our Ridgebacks in our activities we have made an effort to train each individual early on to be good canine citizens. Ridgebacks are very smart and responsive and can master the basic commands: down, stay, come, off, quiet in relatively short time. However they are independent thinkers and may be quite stubborn at times. Training sessions are kept interesting and motivating. Repetitive exercises lack purpose for this breed. 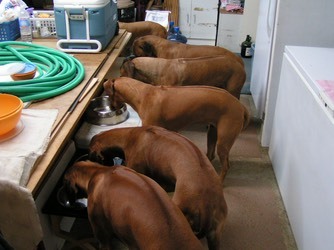 Our Ridgebacks love to make us happy and enjoy hearing how they have pleased us. This has proved to be very useful in training. Here is a list of several books (scroll to bottom) covering the history and behavior of Ridgebacks recommended by RRCUS. 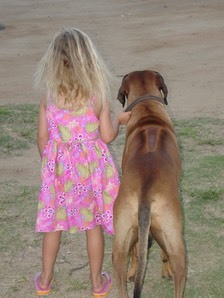 In general Ridgebacks are patient with children and usually tolerate their advances. However, if they are not used to children they may prefer to withdraw to avoid being fussed over. When they are raised with children they seem to develop a sense that the kids should be treated with a different level of understanding. The Ridgeback’s cooperativeness and clownish behavior provide fun-filled entertainment for all family members whatever their age. We have shared our lives with Ridgebacks for over thirty years and are continually impressed with their intelligence, understanding and devotion to our family. Our goal is to place our pups in their forever home. 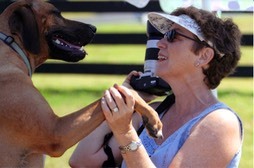 We hope that new owners can experience the joy of adding a Ridgeback to your family.